Charge by phone at the TSO Office, (785) 232-2032. Hours are 9:00 a.m. to 5:00 p.m., Monday through Friday. Major Credit Cards accepted. Email the TSO office at tso@TopekaSymphony.org or fax (785) 232-6204. Tickets may be purchased at the site of the performance one hour prior to the concert. While we are not able to offer ticket refunds, we will mail you a receipt for a tax deductible contribution if you donate your tickets for resale. You must notify the Topeka Symphony office 24 hours prior to the performance in order to be eligible for the tax deductible receipt. Groups of 10 or more receive discounts on select concerts. For more information, call the Topeka Symphony Office at (785) 232-2032. 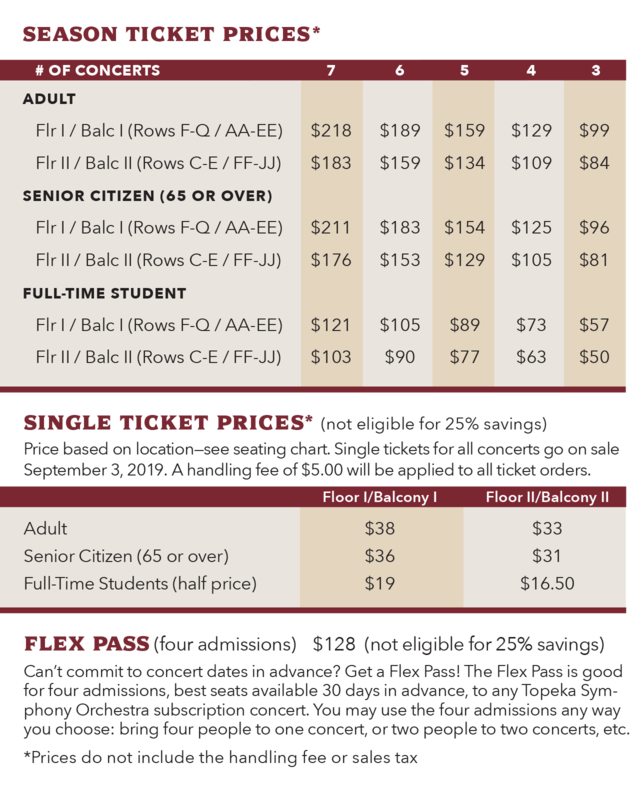 Senior discounts (65 or older) are available for Season Ticket purchases only. Students (K-12 or full-time college students with ID) may purchase reserved tickets for 1/2 the regular price. To respect the listening enjoyment of the audience in the hall, patrons arriving after the concert begins will be seated only during designated pauses in the program. Latecomers are asked to wait quietly until the first convenient break in the program. If you need to leave early, we ask that you do so between program works so as not to disturb others. 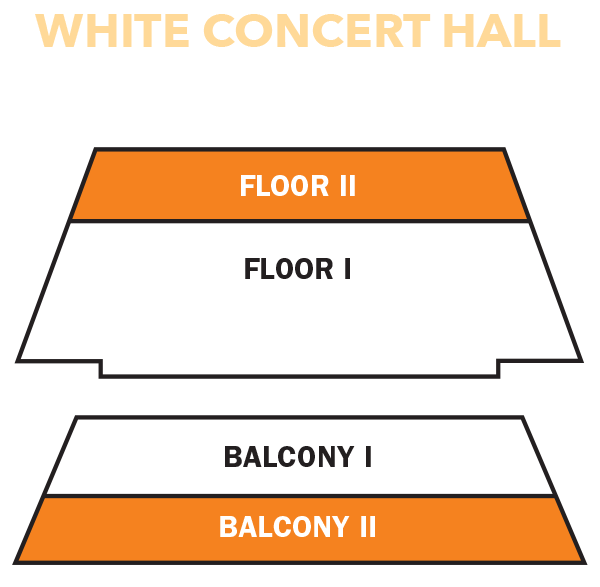 White Concert Hall is accessible to persons with special needs. Please call the Topeka Symphony Office at 232-2032 in advance to make special seating accommodations for persons in wheelchairs or to request large print programs or assistive listening devices. Cameras and recording devices are not permitted in the concert hall. Pagers, alarm watches and cellular phones should be turned off prior to the performance. 25% off for new season ticket subcribers! The Topeka Symphony is proud to offer its patrons many different options for purchasing tickets. You may purchase tickets by calling 785-232-2032, emailing the TSO office tso@TopekaSymphony.org or faxing 785-232-6204. Hours are 9:00 a.m. to 5:00 p.m., Monday through Friday. 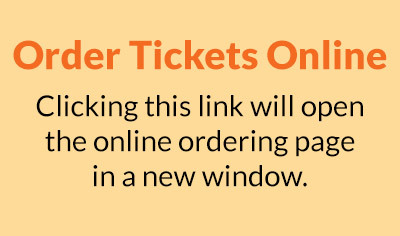 You can also buy tickets online. 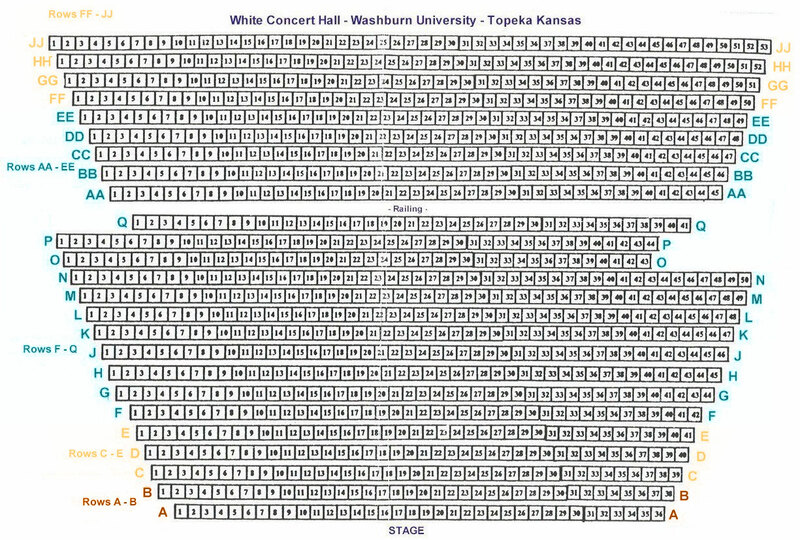 Concerts are held at Washburn University's White Concert Hall at 7:30 PM. Click here to view a detailed seating chart. All seats are reserved. Tickets may also be purchased 60 minutes prior to each performance. A handling fee of $5 will be applied to all ticket orders.